This is true of Marketing, HR, and other functions. All part of the backbone of operations, but not the operations themselves—professionals within these functions must establish their influence in order for their department to gain attention. Without getting too philosophical, in order for someone to gain influence in an organization, they have to believe that they provide a hard-dollar bottom line contribution, not just expect others to give them the treatment they desire. Hansen points out that “only 20% of CFOs feel the CPOs (Chief Procurement Officers), and their departments, offer any value, from a competitive standpoint, for the company.” That isn’t something any procurement professional wants to hear – so how do we change this mentality? "If you think that you are a second-class citizen versus direct procurement, then you are going to get that reaction," said Brian Davy, head of non-production procurement at Jaguar Land Rover. "We're not the poor relation of direct purchasing, what we do is fascinating and varied." Making the strategic sourcing of the indirect procurement team attractive to a room of C-suite executives is part of attaining the best materials for a business. A corporation cannot function on raw monetary capital alone, which is why it needs to be invested in both physical and intangible products that can improve the overall functions of the workplace. As more and more departments become involved in procurement, the time of change has come. Departments that traditionally didn’t lay claim to procurement activities are getting more involved in the process. This puts procurement professionals at a center of power within their organizations – if they choose to seize it. If you plan on attending ProcureCon Indirect East, remember the importance of perception and the role that “giving in” to an inferior role can play in the success of your department. And remember to meet up with us while you’re there: Want to improve your indirect procurement practice even more? 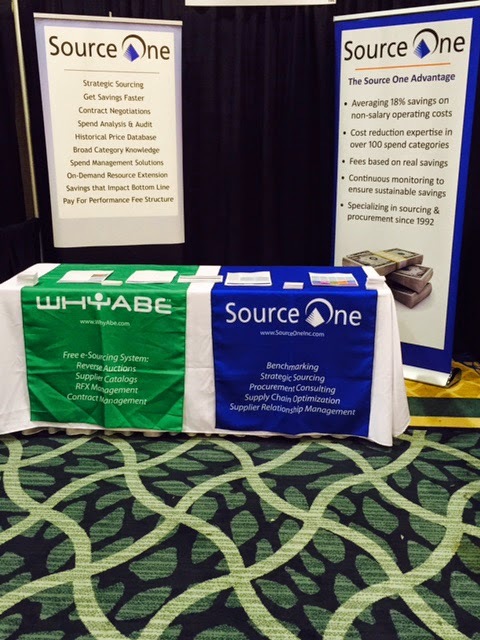 Source One is happy to start up a discussion to help you learn more about indirect procurement optimization. Please contact us at hgrossmuller@sourceoneinc.com and we can schedule some time to meet.